From May 6-10, we will be hosting our final book fair of the year. It's a BOGO event, buy one item, get the second of equal or lesser value for free. During our March book fair, just over $5000 in product was sold including almost $1000 using the new debit/credit card machine that was provided by Scholastic. From those sales, we immediately put over $700 in books in to some home room classes. With the proceeds from the book fair, we have 4 boxes of books that will be added to the library in April. Look for the best deals of the year at our final book fair from May 6-10 with the BOGO event, buy 1 book get 1 free for the same or lesser amount. Not all of the books listed are physically at the school. Any books that are not at the fair or are sold out can be ordered. Orders are placed on Friday, March 8th and typically the books are here by Thursday, March 15th. Book fair purchasing times during interviews are Thursday, 3 PM - 7:30 PM and Friday, 9 AM-12 PM. Thanks to the generous support of our school families during our November book fair, we were able to add 45 English books to our library. 25 French books were added earlier in the month. We have also ordered 120 books that will be added as they arrive from the distributor over the next 2-3 months. 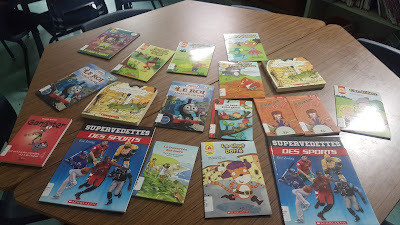 Here are some of the new French books that have been added to our library. They were purchased with some of the proceeds from the recent book fair. English books will be added soon. Unfortunately due to weather issues, the book fair will be packed up and unavailable next week. Scholastic will be back in March with another book fair. Due to last week's storm the book fair hours have been extended. The book fair will be open to families on Thursday, November 29th from 3 PM-7:30 PM. Students can purchase books on Tuesday, Wednesday, and Thursday between 8:45 and 9:10 AM and 12:10-12:45 PM. With impending weather on Thursday, I will be in contact with the book company to see what we can do.